Does your organisation or business produce items which need to be dealt with by clinical waste incinerators? The UK regulations for dealing with this waste are stringent and complex. The aim is to prevent contamination of people and the environment, and the spread of infections and diseases. So, here’s our useful guide to the process – from identifying and storing the waste to taking it to clinical waste incinerators. It is defined as any waste which is wholly or partly human or animal tissue, blood, or other bodily fluids, pharmaceutical products or drugs, dressings and swabs, needles, syringes, or sharp instruments which may prove hazardous to people coming into contact with it. Waste from dental, veterinary, and medical practices, pharmacies, nursing practices, from scientific investigations using tissue or blood, from treatment centres, care practices, teaching or research facilities using such matter, or waste blood from transfusion services can be included in this definition. Some clinical waste is classified as special waste and comes under the Hazardous Waste (England & Wales) Regulations 2005 and the Special Waste Amendment (Scotland) Regulations 2004. 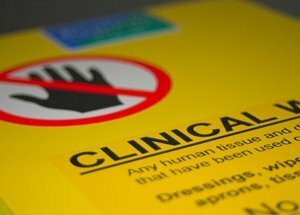 The UK government says that healthcare offensive waste such as protective clothing like gowns, masks, and gloves, and outer dressings, all of which aren’t contaminated with body fluids, is non-hazardous, as is sterilised laboratory waste. What it calls municipal offensive waste, such as nappies, sanitary protection, and incontinence pads, are also non-hazardous. They are not classed as clinical waste and must be stored separately from it. How should it be stored and dealt with? 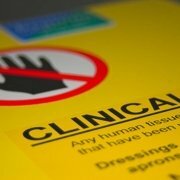 There are clear regulations for storing clinical waste. Sharps such as needles must be held in rigid containers, and other clinical waste should be in yellow or orange plastic bags marked for clinical waste. It should all be secured in a locked container. Items which are infectious and contaminated chemically must go in the yellow bags, while the orange bags are for infectious, uncontaminated waste. Any hazardous waste has to have the correct waste transfer note, be categorised and described correctly, and it must be disposed of at a licensed facility. The majority of the facilities where waste is processed are clinical waste incinerators. How do clinical waste incinerators work? Waste must be held at a properly licensed waste transfer station then send on to the incinerators. They use high temperature incineration at a temperature of 1,100C to completely destroy items and leave inert residues. Generally, this reduces the volume of the incinerated items by 80% and reduces the amount of waste going to landfill where greater amounts of greenhouse gases, hazardous air pollutants, hydrocarbons, nitrogen oxides, and dioxin would be produced compared to an incinerator, some scientific studies claim. Clinical waste in landfill could also leach into local watercourses, polluting the environment and spreading disease and infection. Some of the incinerators also generate energy when waste is burned. In Sweden, 8% of the country’s heating is generated from 50% of the waste it burns. In England alone, 263,000 tonnes of clinical waste can be destroyed every year. One incinerator in the Wirral can handle 100,000 tonnes in a year. How do you choose the right waste management company? Choose a licensed company with a track record in successful clinical waste removal, such as Inspire Waste Management. They will understand the regulations and the different categories within clinical waste and will carry out the transfer to the right disposal facility, ensuring your paperwork is correct. Do you need advice on clinical waste from our Inspire Waste Management team? Contact us on 0800 002 9282.